In a move reminiscent of the United Airlines takeover by Continental (the merged airline became United), American Airlines is in effect to become part of US Airways, the combined operation being called American. 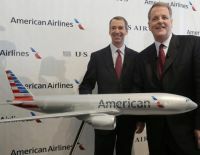 In fact US Airways itself is the product of a reverse takeover by America West, that disappeared carrier’s headquarters in Tempe, Arizona likely to be the centre of the new American. The Centara Watergate Pavillion Hotel Bangkok, a 4-star property located at Rachaprarop and above the Watergate Pavillion shopping complex, is planning to open on 4 April. Airbus issued a somewhat convoluted statement last Friday (14 February) saying that it is confident that the lithium ion (Li-ion) main battery it has been developing with French company Saft for the A350 XWB aircraft is robust and safe. The flight test programme will go ahead as planned. Next Friday (22 February) the Air France (AF) annual media briefing being held in Paris could be the catalyst for unveiling a CityJet suitor. The airline, established in 1992 with its hub at London City Airport (LCY), has been fully owned by AF since 2002, is a loss maker, and is up for sale. AF is on record as saying that two potential buyers are lined up. The airline includes VLM Airlines which has a separate AOC but likewise is branded as Air France. A £3bn five-year investment plan has been unveil by Heathrow, which has not been well received by the airlines, noting that the cost will have to be passed on to passengers. The Civil Aviation Authority (CAA) is the final arbitrator and will announce its findings next January. If approved, the charges would increase from a maximum £19.33 per passenger today, to £27.30 in 2018/19. 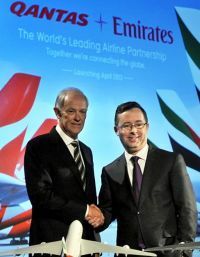 With the opening of the new Concourse A at Dubai International Airport’s Terminal 3 (see BTN 11 February), Emirates and Qantas can now complete a vital part of their unique industry partnership programme announced last year. After receiving the Spanish Government's decree specifying which flights must operate under "minimum services" rules during the planned intermittent strikes by airline employees, Iberia has published the list of flights cancelled in the 18-22 February period, which can be viewed on the Iberia website. In this week’s issue of Business Travel News we publish the timetable for what many agree is the most important future issue facing the Government – the air transport outlook of the United Kingdom, or the Davies Commission. Last week Business Travel News questioned if Davies was on the right track (BTN 11 February), and it quickly produced discussion. In the last seven days the Mayor of London has announced his own survey (paid for by Transport for London users and the taxpayer). The London Assembly has taken evidence, and also the Transport Select Committee of the House of Commons. Contributors to Davies have until 19 July 2013 to make their comments, not to exceed 60 pages! It gained very little exposure at the time (hence our coverage now) due to events just up the road, but HM The Queen and Prince Philip (who claimed to be a retired aviator) found time during the London Olympics to visit London City Airport as part of its 25th anniversary celebrations. 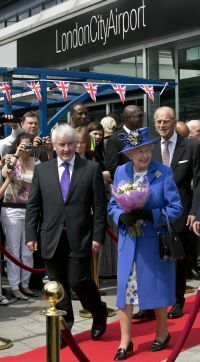 Her Majesty arrived midday 28 July and met long-serving employees, members of the local community, the airport owners and hierarchy, the Mayor of Newham and children from the airport’s chosen charity, the Richard House Hospice. She unveiled a plaque commemorating her visit. Padraig O Ceidigh, synonymous with Aer Arann for nearly 20 years, has ended his association with the airline, resigning as a Director and Chairman. His departure coincides with the Stobart Group gaining a majority shareholding in the Dublin-based airline. In another move Aer Arann has extended its Aer Lingus franchise deal until 2022. It aims to double passenger numbers to more than two million in five years. City Hall (misnamed – see below) was the venue last week for a roundtable discussion by the Transport Committee of the London Assembly on air transport needs. This is an entirely separate process to that being personally orchestrated by TfL for the Mayor of London. The Committee also heard representations on 15 January and will discuss Crossrail on 7 March. It will make a representation to Davies. Following last week’s Business Travel News (BTN 11 February) COMMENT article regarding the Davies Commission here is the official timetable for its deliberations. Heathrow may not seem to be the favourite airport of Britain’s national media but is liked by investors. Major shareholder, Spanish infrastructure group Ferrovial, has been reducing its interest and finding no problems in attracting new patrons. It remains the largest shareholder although its stake has been reduced to 33.65%. The two Qatari directors have taken their seats on the board following the Gulf state’s sovereign wealth fund purchasing 20% of the holding company for £900m last year. With what would seem to be a clash of interests Qatar Airways’ outspoken CEO Akbar Al Baker has been appointed together with Ali Bouzarif, from Qatar Investment Authority. Al Baker has previously criticised the UK Government for its failure to increase hub capacity with Heathrow “bursting at the seams”. Pakistan International Airlines (PIA) is to introduce a Boeing 777 on direct flights from Leeds Bradford (LBA) to Islamabad from 13 March. It becomes the largest aircraft to serve the airport. 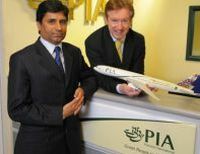 PIA said it was introducing the aircraft due to the “high demand from travellers in Bradford and the surrounding Yorkshire region” who want to fly to Pakistan. Perhaps not known to a younger generation Reg Turnill (97) has passed away. 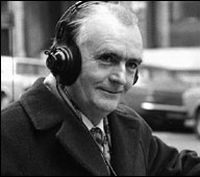 He was BBC Radio’s aviation and space correspondent during some tumultuous years from the late fifties to a time when Concorde (of which he was a great supporter) was well into service. A quiet, unassuming and affable man he always found time to help young entries into the profession. Rookie pilot to air traffic control. “I am out of fuel”. “Reduce speed to best glide pitch”. “No real problem. I am on south apron and am looking for gas truck”. 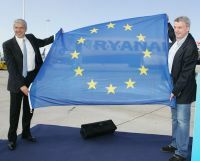 Ryanair's latest bid to take over Irish rival Aer Lingus has been blocked by the EU Competition Commission. Ryanair called it "political" citing BA’s takeover of bmi, which it claimed was a monopoly, and said that it would challenge the court’s decision. Ryanair had described the bid, its third, as a final attempt to grab its rival. It was thought that CEO Michael O’Leary planned to change Aer Lingus into a low-cost long haul airline operating out of Dublin, and perhaps Stansted. Speaking to the media at the opening of Dubai International’s new Concourse A in Terminal 3, President of Emirates, Tim Clark, took questions on the proposed Boeing 777X. “I believe it will be launched and we'll see that in six to nine months", he said. 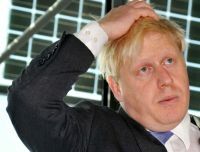 In another high profile move London Mayor Boris Johnson has announced an (expensive) team of consultants to draw up plans for three possible sites he has identified for a new hub airport. This move, funded by Transport for London (TfL), seems to replicate the official Government enquiry, the Davies Commission, although it will make a presentation to the official jury. A similar situation arose at Luton Airport last year where both the freeholder, the local Council, and the airport operator duplicated costly enquiries, with more or less the same result. The airport is actually outside the Mayor’s remit. SITA, the airline information technology company, has published it seventh Passenger Self-Service Survey in conjunction with Air Transport World (ATW). Without any fanfare (and not noted to the media) KLM is to become the first of the major European legacy airlines to start charging passengers who check-in luggage on short haul services. 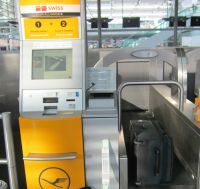 Traditionally Europe’s major airlines such as Air France, British Airways, Lufthansa and KLM itself have left most ancillary charges, such as hold baggage, to the no-frills carriers. Rezidor, one of the fastest growing hotel companies worldwide and a member of the Carlson Rezidor Hotel Group, has opened the very first Radisson Blu property in Mozambique – the First Class Radisson Blu Hotel, Maputo. Icelandic airline WOW Air, founded in 2012, is to double its flights from Gatwick to Reykjavik from 2 June. Twice-daily flights will depart London at 12:15 and 20:40 on Sunday, Monday, Tuesday, Wednesday, Thursday and Friday with a daily flight on Saturday, which will depart at 12:15.